Mariya Sarinova won the 800-meter gold medal at the 2012 Olympics. As distances increase in track, so does the need for planning and running strategy. In sprint races up to 400 meters, speed and form are the main concerns. Although it's something of an oxymoron, the 800-meters is considered the shortest distance race. Proper pacing and positioning are crucial in winning races and running your personal best times. There are also unique elements to the 800-meters, such as the break after a staggered start, that must be taken into account. The 800-meters uses a staggered start and allows you to cut in toward the rail as you come off the first curve. Don't try to cut in too quickly. If you are on the outside of other runners coming off the first curve, fix your vision on the far curve and run in a straight line toward it. You have the entire length of the backstretch to reach a position near the rail. Settle into a pace that is fast but also comfortable for you. Avoid a sudden change of pace early in the race as it will sap your strength for the stretch run. Focus on keeping your facial muscles and upper body relaxed and free from strain -- tense muscles will slow you down. Your body plays tricks on you during the second lap of the race. 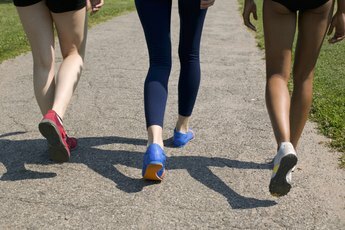 If you feel like you are maintaining the same pace, you are actually slowing down, according to the Tips4Running website. So pick up the pace from the 400- to 600-meter mark, but do so smoothly and not with a sudden burst. You're running on empty the last 200 meters. Nevertheless, stay as smooth as you can and focus on maintaining your best form. College runner and Tips4Running writer David Tiefenthaler says that when he came off the final turn, he imagined a catapult launching him down the stretch and across the finish line. As the website Coaches Education explains, you'll find yourself running in traffic in most 800-meter races unless your style is to lead from the start. It's easy to get boxed in, pushed or jostled if you are too eager to establish a position in lane one. It's critical to avoid interruptions in your pace -- if you use a burst or two of acceleration to get out of a box or recover from a push, you'll have little energy left for the sprint to the finish. Usually, it is better to run a few meters farther, in lane two or three, during the first 300 to 400 meters until the pack strings out a bit. When you pass runners, move up on their shoulder on the curve and pass on the straight so you can move back toward the inside before the next curve.